Greenpeace activists who last week prevented a tanker loaded with palm oil from Indonesia from mooring at Rotterdam port and earlier on Nov. 17 illegally boarded the same cargo vessel off Spain in protest at what they described as an ecologically damaging commodity could be regarded as saboteurs of the Indonesian economy. It is one thing to campaign to influence public opinion against unsustainable farming practices, but it is against the law to unilaterally and arbitrarily block the passage of a legal shipment of palm oil. Hence, the demand by the Indonesian Employers Association (Apindo) and the associations of palm oil companies and smallholders for the government to take stern measures against the Indonesian chapter of Greenpeace is fully justifiable. The campaign against palm oil has long been riddled with misperceptions, amid claims that palm oil has caused massive deforestation in developing countries, notably Indonesia, the world’s largest producer. The debate over palm oil has not always been based on straight facts and has often been biased in favor of noisy demands from environmentalists who are unable to suggest workable solutions to the industry’s multilayered complexity, which essentially boils down to the issue of poverty-alleviation. Meanwhile policymakers in Europe, under pressure from vegetable oil industry associations and green campaigners, have rushed to build up regulatory barriers against palm oil products entering their markets. For almost two decades, palm oil has been a target for European agricultural interests, lawmakers and NGOs, with the European Union seeking to block the commodity both as a food ingredient and energy source, citing environmental and human rights violations in its production. So vigorous has been the negative campaigning against palm oil that we, along with several scientists in Europe itself, have concluded that allegations of deforestation, human rights and violations of workers’ welfare are a subterfuge to protect EU producers of vegetable oils such as soybean, rapeseed and sunflower, which have become increasingly uncompetitive. Another misconception is that palm oil is bad for health as its extracts can increase heart problems. But Bill Wirtz, a policy analyst for the Consumer Choice Center (CCC), cited in a recent article the findings of studies by the School of Medical Science and Technology of the Indian Institute of Technology in 2009 and the World Journal of Cardiology, that palm oil’s effect on blood cholesterol is relatively neutral when compared to other fats and oils. The CCC claims to represent consumers in over 100 countries and monitors closely regulatory trends in Washington, Brussels, Geneva and other hotspots of regulation, and informs and activates consumers to fight for greater choice. Even with healthier nutritional alternatives, for the sake of a fair market, consumers should be allowed to freely choose which fats they want to consume. It is certainly ill-advised to put labels on one particular product or campaign for a boycott on another. Banning palm oil in biofuels and severely restricting it in foodstuffs and other consumer goods, as the EU plans to do, while global demand for vegetable oils steadily increases, could even increase hazards to the environment and biodiversity. The United Nations Food and Agriculture Organization (FAO) records that palm oil now accounts for over 50 percent of global vegetable oil consumption and has increasingly been leading the market as a result of the much lower yields of other vegetable oils, produced mostly in temperate-zone countries. The latest report of the Switzerland-based International Union for the Conservation of Nature (IUCN) warned in a report released at a recent international forest conference in Oslo that completely replacing palm oil with other vegetable oils would be even worse for the environment. The key factor, the report said, is that the palm oil yield is nine times higher than those of other vegetable oils. Hence other vegetable oils would require up to nine times more land than oil palm to produce the same volume of oil. Palm oil is currently produced from just 10 percent of all farmland dedicated to growing oil crops, yet accounts for 35 percent of the global volume of all vegetable oils and half of the world’s population uses palm oil in food. So if we ban or boycott it, other, more land-hungry, crops will be required. Palm oil is widely used in food, cosmetics, cleaning products and fuel, and is cheap to manufacture. Growing oil palm is about 10 times more effective than growing soybeans or rapeseed. Such a productive and profitable crop would not be easy to replace. It is understandable for Indonesia to proclaim that palm oil is here to stay. Palm oil contributes around US$20 billion to Indonesia’s annual exports and employs over 8 million workers in the estate-cultivation and processing industries. More importantly 40 percent of the estimated 12 million hectares of oil palm estates are owned by about 2 million smallholders. Therefore international cooperation is urgent to help producing countries such as Indonesia develop new oil palm seeds with higher yields so that production can steadily be increased on the same acreage of land, thereby preventing encroachment into primary forests. Over the past 15 years the government has subjected the industry to tougher rules designed to make the commodity sustainable economically, socially and environmentally. Certainly the improvement is still an ongoing process as it not only involves crop cultivation but is part of broader poverty-alleviation programs and the empowerment of millions of smallholders. In fact, oil palm development is currently among the most transparent industries as its practices are periodically examined and monitored by auditors and constantly scrutinized by green NGOs. Palm oil producers are now held to Indonesian Sustainable Palm Oil standards and those of the international multi-stakeholder Roundtable on Sustainable Palm Oil. Kotug has used the occasion of Innovation Expo 2018 in Rotterdam to demonstrate once again its remote-controlled tug development. This time there has been the addition of a remote fire-fighting capability. In 1999 your correspondent witnessed first-hand the Gravesend-based tug Sun Mercia as it was completely enveloped in toxic smoke while fighting a fire on the container ship Ever Decent following collision with a cruise ship off the Kent coast. There was serious concern for the safety of the crew on the tug followed by much relief when the tug reappeared from the smoke and while such hazards are part of salvage operations it illustrates the human factor considerations required with close-proximity fire-fighting. The technical feasibility of unmanned remotely-controlled tugs has been demonstrated on several occasion now including by Kotug and as well as eliminating risks to crews during normal shiphandling operations the concept could allow fire-fighting operations close to burning ships otherwise not possible for manned tugs due to smoke, heat and explosion hazards. Similarly, Robert Allan Ltd and Kongsberg Maritime are collaborating on development of the remotely-operated RALamander fireboat for ports. This recent demonstration of remotely-controlled sailing along with remotely-controlled fire-fighting is a next step in the story that Kotug believes will lead ultimately to unmanned autonomous shipping: once again the training Rotortug RT Borkum was employed for the demonstration. Real-time sensor technology provides the ‘remote-control’ captain with the situational awareness required but Kotug point out that unmanned shipping does not yet comply with current rules and regulations, such rules needing to be amended before tugs can start operating autonomously. Kotug is using its Rotterdam simulator for further testing of unmanned operation tasks. The demonstration was a joint industry project (with no external subsidy) sponsored by a number of stakeholders including: Alphatron for camera visualisation and system integration in the consoles; Kotug, project management and supported MAROF student with thesis “Remote controlled tug boat”; KPN, 4G data sim cards for internet connection; M2M Blue, data connection with VPN tunnel (4G and LAN combined); OnBoard, conversion of steering and engine control signals to internet protocol and vice versa; Rotortug, owner of RT Borkum; and finally Veth, steering and engine control system to take over from local console to remote control and vice versa. The concept is likely to take time to be adopted because it runs strongly against naval traditions which dictate that a ship’s captain needs to be on board but was already technically feasible, he added. Unlike on-board control rooms where officers are usually seated, in case the ship is struck by an enemy munition that would knock them off their feet, in an on-land control room officers could be allowed to walk freely around the room, Mr Cotton explained. The BAE Systems executive said advances in technology could also have a big impact on naval warfare. The AI that Mr Cotton and his team are developing for the new control rooms could spot incoming threats to a warship and instantly prioritise them, so that commanders know which enemy vessels to take out first. BAE Systems is investing £20m into AR and AI technologies to develop future applications for warships. The company plans to trial augmented reality glasses on the bridge of Royal Navy frigates, so it can be in use by officers by the end of next year. The AR glasses will allow an Officer of the Watch, responsible for the ship’s safety, to work outside of the operations room and still be able to see tactical data and other vital information. It will also mean officers will be able to look through fog and mist on the sea to spot ships and planes that have already been spotted by the ship’s radar systems. The AR equipment that the Royal Navy and BAE Systems’ will use during the trial will be Microsoft’s HoloLens headsets, that customers in the UK can buy for around £400 on the high street. It will first be tested in March next year at a Naval military exercise in Southampton, called “Information Warrior 19”. The exercise is used every year by the Military of Defence to test out new hardware and technology in a fake combat scenario. Rotterdam, home to Europe s biggest port is watching the uncertainty in the UK over Brexit with real concern. Voice from the business community are making their fears known in a bid to remind politicians to make sensible policy decisions. “We are very concerned that we will see disruption in the event of a no dealm and again delays and so on and congestions. 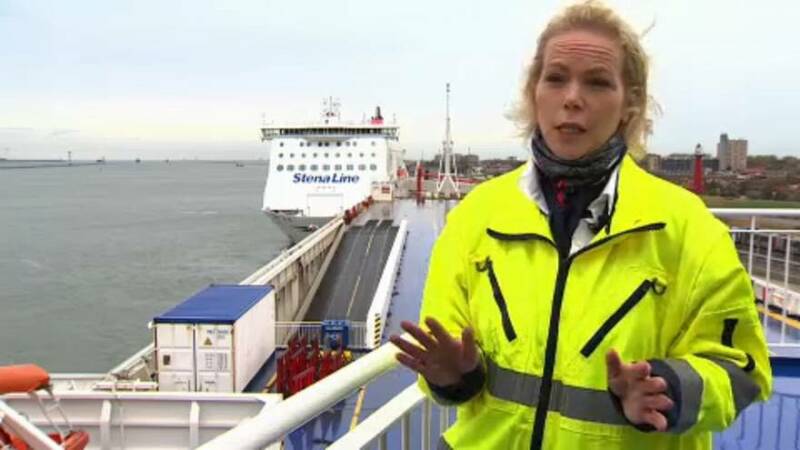 We are concerned and we need clarity,” says Annika Hult, Stena Trade Director, North Sea. Officials expect a 100% increase in export inspections. Ferry operators warn of the end of seamless trade with Britain. “The fallback would be a WTO scenario. If there is no deal reached, and what that would mean is that basically that there will be full controls and so on,” Hult explains. “Very much similar to trade with other third party countries where there are no other special arrangements,” she adds. Stena Line, which runs four or five ships a day to British ports, is worried about delays to cargoes of fresh produce – fresh food, or even something more sentimental. A Rolls-Royce rendering of an autonomous ship. Rolls-Royce photo. The buzzword at the Federal Aviation Administration regarding aerial drones (unmanned aircraft) is “integration. In U.S. airspace, drones will never be commercially useful until they can fly safely when admixed with manned aircraft, which is why the FAA has already begun its Unmanned Aircraft System (UAS) Integration Pilot Program (IPP). The fact that the FAA is willing to consider this possibility is momentous, and now Uber, Google’s Larry Page, and top execs from Airbus and Audi are strapping themselves into the VTOL (vertical takeoff-and-landing) drone movement. There are prototypes now flying and the electronics are here already, so integration of pilotless aircraft into the national air-traffic system is coming, and faster than anyone could have imagined 10 years ago. OCTOBER 23, 2018 — Swedish aerospace and defense contractor Saab has joined forces with Damen Shipyards Group to develop an Expeditionary Submarine for the Netherlands Walrus Replacement Program. “The result of the collaboration will be a customer-adapted submarine for expeditionary missions. This will ensure that the Royal Netherlands Navy continues to play an important role in European waters as well as globally,” says Hein van Ameijden, managing director of Damen Schelde Naval Shipbuildning. In addition, the Walrus replacement will also benefit from the operational lessons reflected in the Swedish Navy’s Gotland Mid Life Upgrade. As a result the Expeditionary Submarine will be equipped with state of the art technology while benefiting from the de-risking on three submarine classes. Saab and Damen say they are creating one of the most modern Air Independent Propulsion (AIP) submarines in the world, which if selected, will be done in consultation with the customer using a ‘design to cost’ approach. This cooperation will also extend beyond the Dutch submarine project, as the two companies see a growing market for this type of advanced conventional submarine.